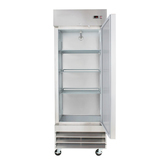 This Eurodib 29" one section solid door reach-in refrigerator is perfect for narrow hallways and storage areas. Keep your smaller back-of-house area well-stocked with this reach-in freezer. It has plenty of storage space thanks to its multiple adjustable shelves and a large internal capacity, but a smaller footprint, making it ideal for tight spaces. With a durable, stainless steel exterior and a painted aluminum interior, you can be sure this unit will last in your busy kitchen. 430 Stainless steel interior and exterior walls, SS304 interior floorm aluminum back. Sefl-closing door witrh 90 degree stay-open feature, removable door gasket, door open controlled light, door locks and kegs included. Adjustable heavy-duty PVC coated shelves. Preinstalled heavy-duty casters with brakes. Digital temperatrure controller with temperature display. Removable installation board, easy for condenser coil cleaning and service. Uses Hydro-Carbon refrigerant R290, which is environmentally friendly and efficient.